When Lew + I were in the process of finishing our basement we didn't put much thought into what we'd use the extra closets for. Storage, more pantry space, another spot to stuff our junk are a few things I assumed would eventually happen. But as our family began to adapt a minimalist mindset, we let go of the excess stuff and only kept what we love and use regularly. Enter BOOKS! I've cherished them since I first learned to read. I remember watching the movie Beauty and the Beast as a little girl and swooning over the incredible library Belle received as a gift. 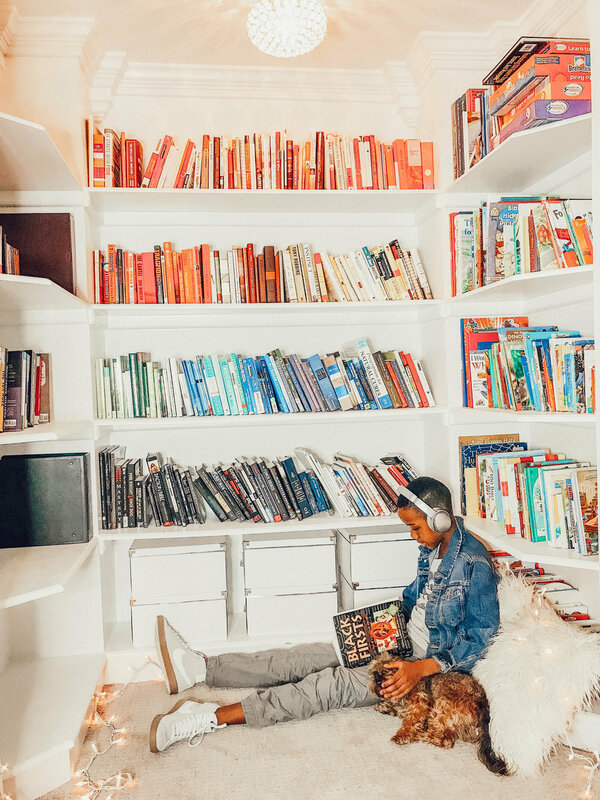 Lewis and I discovered we both shared in a book obsession while dating and fell even harder for each other--and now reading is what brings our family together most evenings. We're not very handy so we had a little help with the shelving + light fixture. But it'd be easy to turn any unused closet into a dedicated space for your books. I've also seen cute ideas for a craft corner, slide-out pantry, mudroom, closet office, etc. Whether you're looking to add more value to a space in your home or just utilize an unused spot in a creative way, the possibilities are endless! I love getting ideas from Pinterest. If you aren't following me already, you can find me here. If you've done something similar in your house, we'd love to see it! Hope everyone is having a wonderful week so far. Xo!